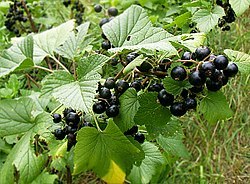 Blackcurrant (Ribes nigrum) is a small, bitter-tasting fruit. It can be found in central and northern Europe and northern Asia. Blackcurrant has a lot of vitamin C in it. Blackcurrant gets its name from its dark color. It is also used to make jelly, ice cream, and cordial. Blackcurrant is a popular flavor in the United Kingdom. Blackcurrants are also used in salads and in baking, similar to raisins. This page was last changed on 4 August 2016, at 15:24.